Perfect combination of realistic dripping wax candle design with secure flameless LED light. The flameless LED candles eliminate your worries of cleaning the residual wax and danger of fire while enjoy your relaxing time at home. Works like a real candle and free to place in your house. ● Decorate dinner tables, centerpieces, weddings, parties, anniversaries, etc. The flameless LED tea light is not waterproof and indoor using is suggested. ♥【Timer Function】 The flameless tea light will light up for 6 hours and shut off for 18 hours automatically in the cycle of 24 hours, which saves energy, avoid forgetting to turn on/off the candle frequently. 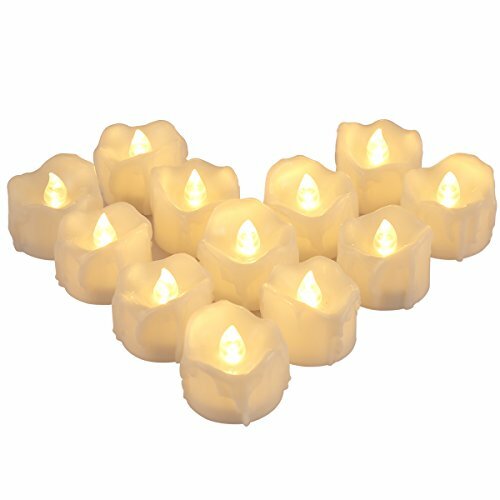 ♥【Realistic Dripping Wax】 Features unique dripping wax design and offers flameless flickering warm white light, create romantic and comfortable ambience like traditional candles for your home, no need to clean residual wax. Beautiful gifts and creates cozy vibe. ♥【Safe Lighting】 The LED tea light is flameless, smokeless, odorless and unscented, works as the same as a real candle but more secure compared to conventional ones, energy-saving, zero carbon emission, environmental friendly, more practical and safe for users. ♥【Wide Application】 Suitable for home decorations, hotels, churches, weddings, parties, bedroom decoration, romantic candlelight dinner, catering halls, festivals, Halloween, Thanksgiving Day, Christmas and other special events. ♥【Battery Operated】The realistic LED candle lights is powered by 12 *CR2032 button battery (included) with long lifetime and easy to replace the battery via the tab at the bottom. Just switch on by the button at the bottom, simple to use, safe for children, senior citizens and pets.